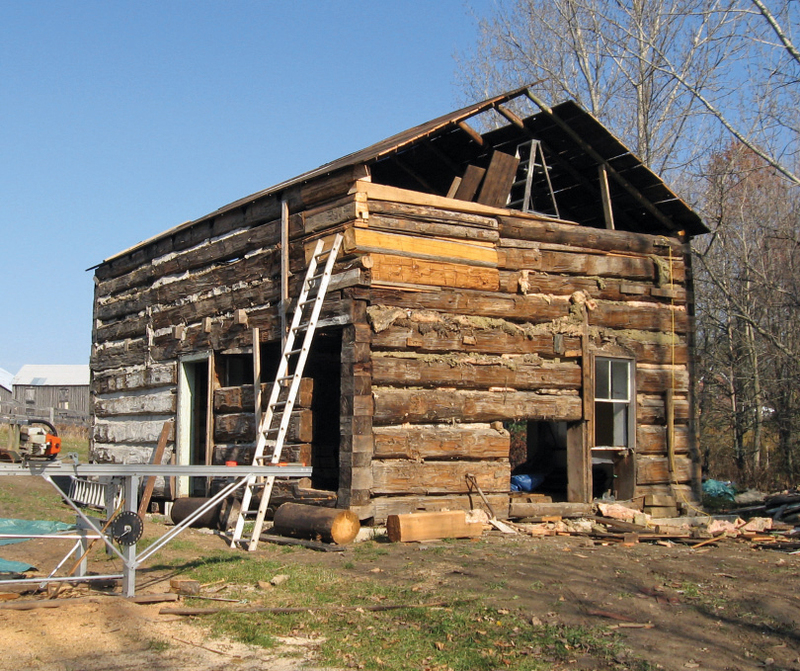 If you happened to be meandering along King Street or Heart Lake Road in Caledon on an August day in 2008, you might have noticed a log cabin chugging down the road. The cabin was making a four-kilometre journey from the land where it had stood since the 1840s to its new home on the foundation of a demolished cabin of the same era on John and Helen Mason’s heritage property. 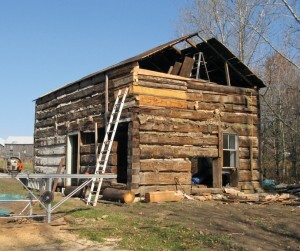 Now, two years later, reconstruction of the cabin is nearing completion and the Masons are planning a get-together in October to show it off. It all began when the Masons, members of Heritage Caledon (the municipal heritage committee), heard rumblings about the Victoria Business Park redevelopment at King and Hwy 10. A nondescript little storey-and-a half house was in the way and had to go. However, as the town’s mandatory heritage impact statement confirmed, beneath the home’s faded aluminum cladding was one of the town’s earliest structures. Caledon heritage officer Sally Drummond was adamant that this remnant of Chinguacousy history should remain in the area – and she had an idea. She had written the report when the Masons applied for heritage designation of their property in 2003, so she knew from the existing rubble foundation and artefact scatter where that property’s original log cabin had stood. 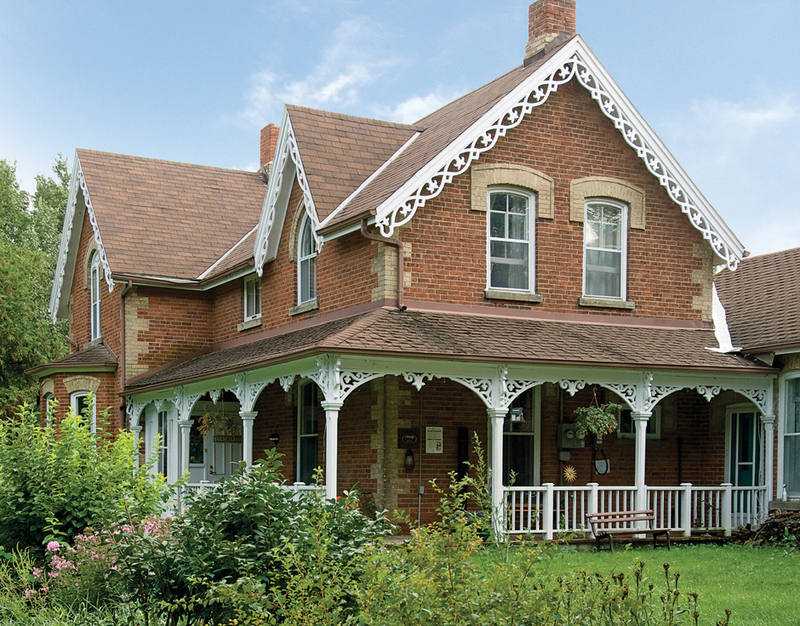 The Masons’ classic Ontario Gothic home and outbuildings, known as the Alexander Smith Farm Complex, received heritage designation in 2003. Photos by Pete Paterson. “I approached the Masons and they thought it would be a wonderful way to complete the whole historical property parcel,” Sally says. The Masons have lived on their Chinguacousy property, known as the Alexander Smith Farmstead, for four decades. Now retired, John, 82, hails originally from England and worked in property management in Toronto where he met and married Helen, a Scottish teacher/librarian. 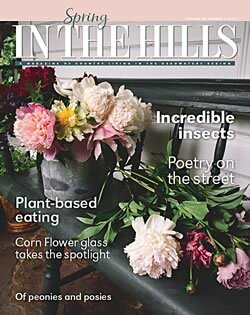 They originally purchased the 100-acre property with friends as a weekend retreat, but slowly “the weekends became longer and longer,” says Helen. They bought out their friends and moved permanently to the property in the early seventies. Furnishings in the log cabin include an ice-box, supplied by a neighbour in exchange for “a few loads of firewood” and the cradle in which all the Masons’ children once rocked. They sold off a fifty-acre parcel to the farmer next door and, since 1978, have been reforesting the remaining acreage. 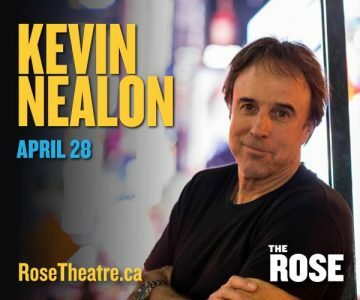 Through programs offered by Toronto Region Conservation Authority and the Town of Caledon, they have planted some 8,000 seedlings over the years. 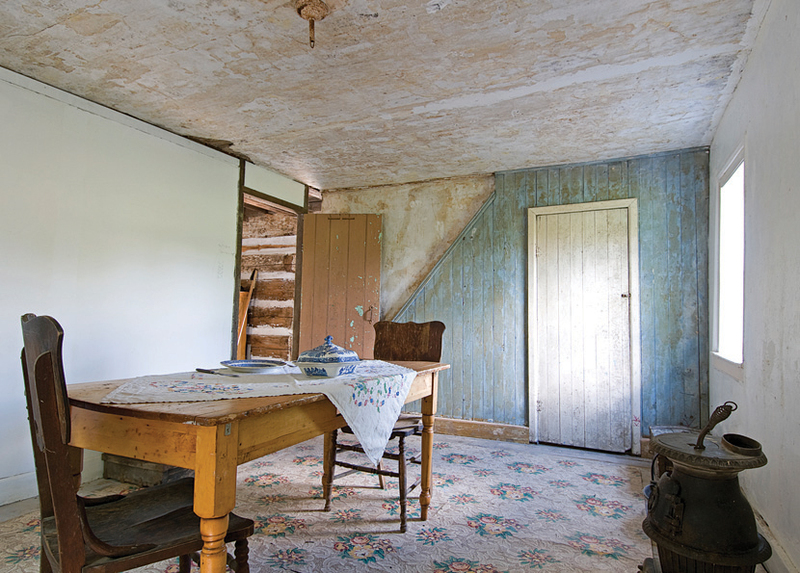 The heritage designation of their property applies to the “historic cluster” of the farmstead area, including orchard remnants, as well as to the significance of the original settlers, the Smith family, who owned the property for 110 years. The Masons endeavoured to preserve this history while making contemporary upgrades, specifically to wiring, insulation and heating. Records show that in 1833 Andrew and Catherine Smith arrived from Invernesshire, Scotland. Wealthy and well-educated, they bought landholdings in Chinguacousy and Caledon townships including the Mason’s future 100-acre parcel. The Smiths’ eldest son, Alexander, worked on the farm and is believed to have built and lived in the log cabin with his wife Euphemia (Effy) Graham. In 1864, Andrew divided his properties among his five eldest sons, and Alexander bought the 100 acres for $800. About a decade later, Alexander built and moved his family into the current Gothic-style brick house. Two other Smith residences have also received heritage designation: an 1850s Georgian-style home owned by Andrew and Catherine on Kennedy Road, and an imposing 1860s brick home on Hwy 10, owned by John Smith (the Smiths’ fourth son, who went on to sit as a Liberal in the Ontario legislature). A temporary front door currently replaces the original one, damaged when the cabin was moved. The interior appears to have been designed as a duplex with two identical staircases that rose to two separate apartments, as well as independent kitchens and living areas. “It speaks to the standard idea of having multiple generations living together,” Sally Drummond says. Census documents show Alexander’s son Andrew, his wife Jennie, their children and farm help occupied six of the ten rooms. His mother, Effy, and sister, Marjory, occupied four rooms. Both Andrew and Effy were listed as heads of households, indicating that the two halves of the home were managed separately. After Andrew Smith died in 1941, Jennie lived on in the house with their son George and his wife Ida, until her death in 1957. George and Ida sold the farm to the Masons and their friends in 1969. 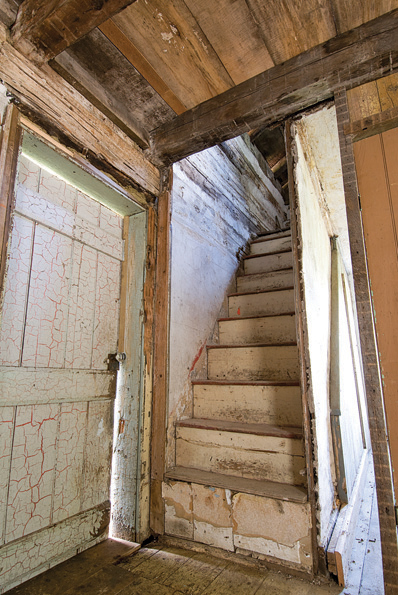 In their ongoing renovations, the Masons have removed the brick wall dividing the upstairs units, as well as one of the staircases. Of equal historic importance are the property’s outbuildings which predate the house, probably to around the time of the original log cabin. They include a U-shaped cluster of three barns, a chicken house and implement shed, as well as the original two-hole outhouse. The very large principal barn has been spotlessly cleaned by the Masons and served as reception hall for their three children’s weddings, as well as the occasional party. It boasts a dance floor, kitchen, toilets, mirror ball and twinkle lights. The addition of the Victorian-era log cabin, sitting within inches of the original cabin’s footprint, completes the historic complex. These past two years have been “a labour of love” in John’s words. However, they have not been without frustrations relating to the building code, permits and inspections. The most annoying was the engineering report required to assess the roof slope in relation to snow load. It seemed redundant considering that the roof has held up under the snow for 170 years. 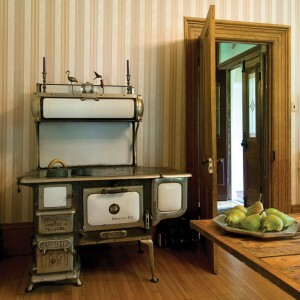 The “Princess Pat” cook stove came with the house. It’s now purely decorative, but Helen cooked on it a few times before removing the chimney pipe which rose through the centre of the kitchen. “Some of these requirements don’t work and should not be forced on heritage buildings,” Sally Drummond says. Eventually, though, all the i’s were dotted and the t’s crossed and the 29-by-20-foot cabin was successfully relocated, with considerable help – both financial and physical – from the developer, the heritage committee and many other friends. Historically the log cabin was owned by the Crawford family from 1854 to 1888 and is known as the Andrew Crawford House. An extension had been added not long after the cabin was built and, over the years the twelve-inch high logs were covered over and over again, first with horizontal boards, then vertical boards, then the inevitable Insulbrick, and finally aluminum siding. 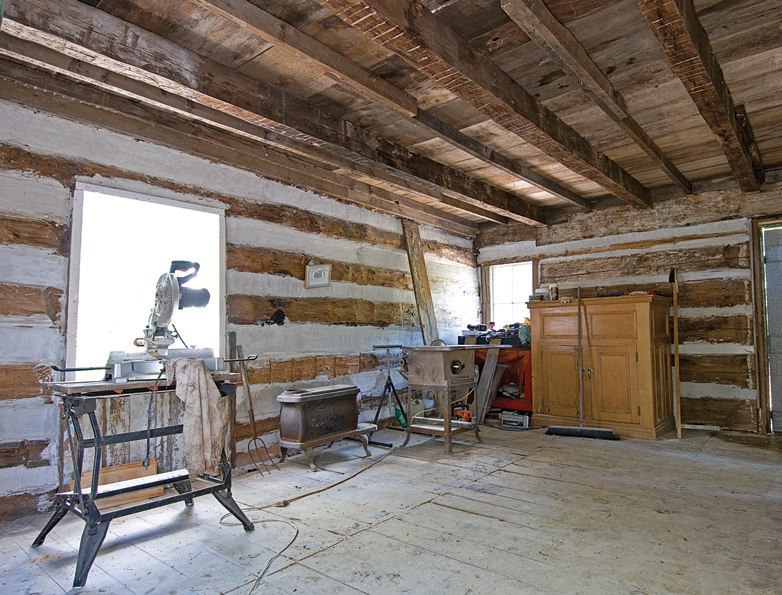 A bathroom, installed in the corner of the second floor, was used as a passage to the addition, and the original floor and log walls in that area had been removed. The 1861 census shows that twelve people were living in the cabin – a claustrophobic number for such a small home by today’s standards. A cast iron stove from friend Sally Drummond. On moving day, the Insulbrick siding served one last purpose: it maintained the building’s integrity during the two-hour transport. In order to avoid overhead wires, the roof was removed and police and hydro escorts accompanied the house on its journey. Unfortunately the original wood-plank front door was destroyed during the process and John is on the lookout for an appropriate replacement. Without assistance the Masons restored the log roof rafters, replacing missing ones with trees cut from their property. “That was rather scary,” admits Helen, a 69-year-old who looks far too petite for the back-breaking task. The Masons threw nail-removing parties at which friends pried thousands of hand-hewn nails from the roof sheathing, which John then re-applied. A source in Bancroft provided a replacement for the original roofing material – Ontario white cedar shingles. Another generous offer came from a man near Acton who had built his own log cabin and made replacement logs to measure for them, charging a mere dollar a foot. The log house, halfway to completion. The restoration project involved historical sleuthing, police escorts and nail-prying parties. Helen has salvaged wallpaper bits from interior plaster walls, which she plans to frame and display. She enjoys telling the story of how she was observing an archaeological dig on the Crawford property and found a fragment of china that was identical to a piece she had found near her property’s old log house foundation. “Somebody said, ‘Oh, the Crawfords came to the Smiths’ for dinner and brought cookies and left the plate’,” she laughs. As the log cabin reconstruction approaches completion, the Alexander Smith Farmstead will have come full circle, a marvellous snapshot of how our forebears lived and worked. The Masons hope to be able to make the cabin available for people to see – possibly school groups and walking tours. If you’re interested in sleuthing out the history of your own house or property, the best place to find your first set of clues is at your local archives. 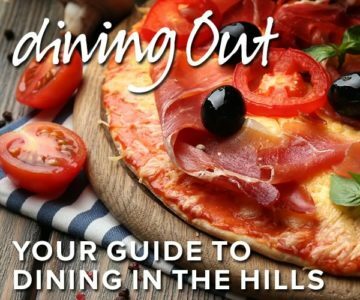 Depending on where you live in the hills, that will be Dufferin County Museum & Archives, Wellington County Museum & Archives, or the Region of Peel Archives. Take the legal description of your property (the concession or plan and lot number) to the archives and ask to see the Abstract Index to Deeds. It will give you basic information, starting with when and to whom the Crown patent was issued. Subsequent registered transactions, including change of ownership, mortgages and wills, are listed and assigned an instrument number. The Peel archives has these records up to the early 1900s. Once you have an instrument number, you can review the relevant document. Wills, for example, may offer clues such as where an owner came from, whether the property was their primary residence, and the like. Census records will tell you such things as names, ages, occupations and family relationships, and whether the occupants were owners or tenants. Data from censuses conducted from 1851 through 1901 often describe the house size and construction material, such as ten-room stone house, log cabin, etc. Tax assessment roles provide the dollar value of the real property (land, buildings and fixed assets) and still more clues. A leap in value, for example, could suggest the addition of a new structure. The William Perkins Bull collection is a unique resource in Peel. Bull was a Chinguacousy/Brampton-area philanthropist in the 1920s and ’30s who travel-led with a team of researchers throughout the county recording family stories. They contain personal family information that would be impossible to track through census information only. Often descendants of early owners still live in the area, and may be willing to flesh out stories. In the past decade, the Internet has made research much faster and easier. The website for the Peel archives, is currently under construction as part of the expansion of the Peel Heritage Complex. In the meantime, you can search for and see online such useful documents as the Illustrated Historical Atlas of the County of Peel, 1877, that contains maps showing lot boundaries by owner and even some early buildings. Information after the early 1900s can be found at the land registry office where the Abstract Index is available on microfilm. Work at your research from both ends, tracking back from the present, as well as from the origins. Be prepared for a lot of leg work and inevitable dead ends.